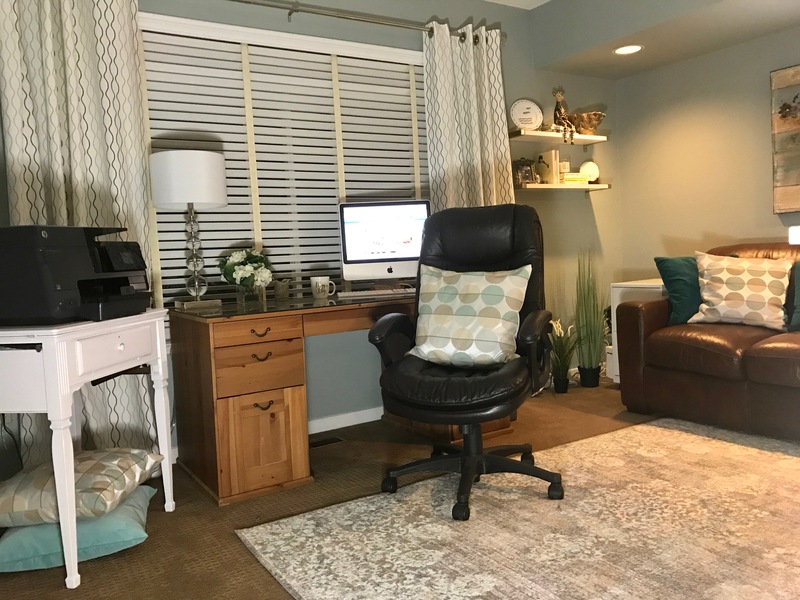 As you may have seen, I have just finished my home office/guest room makeover! OK, I am super closer to finishing 🙂 I do have a few lose ends that still need to be cleaned up. Doesn’t it look beautiful? I love it! I have decided to take this one step further and reorganize the guest bathroom. This way, when my house guests arrive – the room and the bath are shiny and ready! 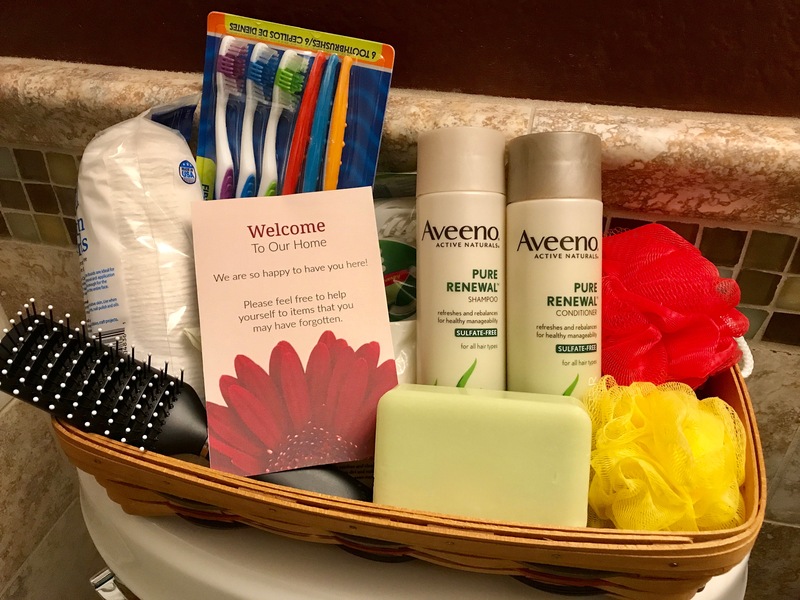 Not only did I clean out the bathroom and reorganize all of the bathroom supplies, I also put together this great Welcome To Our Home guest bathroom basket. A perfect way to great my visiting guests to our home. 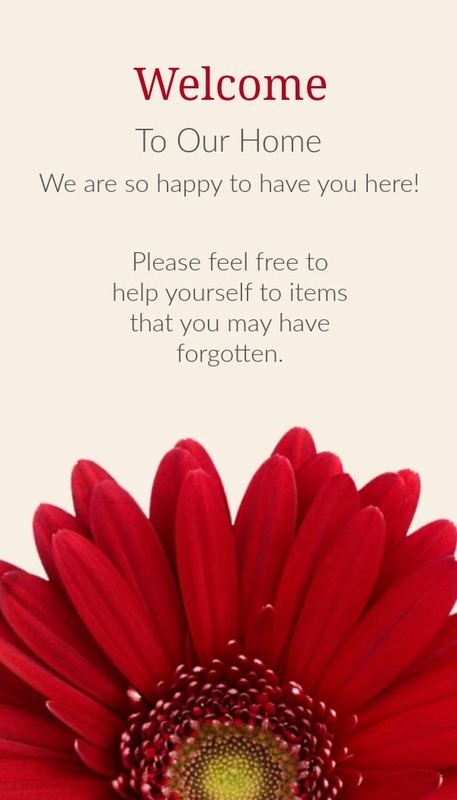 And just for you, you will find a copy of the welcome card lower in this post – all ready for you to print. We are really trying hard to live a healthy life in our home. Have you seen some of the delicious salads that I have been making for lunches? Eating more whole foods feels great and it is so good for us! As I have found out recently, living a healthy life means more than just looking at the food you put into your body, it is also about the products you bring into your home! It’s important to me to understand what I’m putting in and on my body. Years ago we switched to fragrance free laundry detergent when my oldest daughter was dealing with skin allergies. It was a simple switch that made me feel better as a mom and was good for the whole family. Recently, I have discovered sulfate free products, and I have decided to switch again. Getting rid of harsh ingredients just feels like the right thing to do! It is a healthy living choice for our family. I started with changing my laundry detergent when I found all® fresh clean ESSENTIALS®. 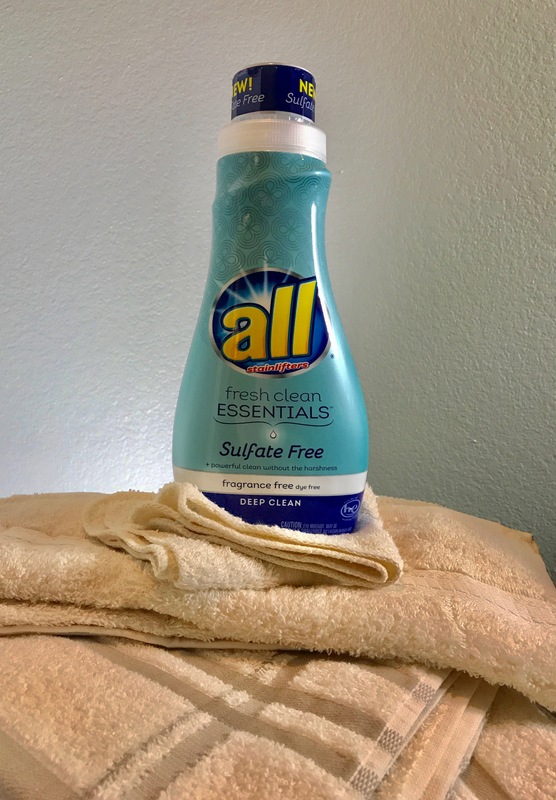 I loved that NEW sulfate free all® fresh clean ESSENTIALS® delivers a powerful clean without harshness. It is also fragrance free and dye free. If you ever watch me shop in the grocery store, you will see that I am forever reading the label; I am looking at the ingredient lists as well as the sugar content of everything. Almond butter should contain almonds only! Really. Well, I am now looking at the ingredient list of many of my household items – especially if it is something that goes on my body. all® fresh clean ESSENTIALS® makes checking the label easy! The ingredients are included on the back of the bottle so you know what ingredients are going onto your family’s laundry. It is one of the first laundry products to put ingredients out there for consumers to know what the ingredients are and why they are essentials. 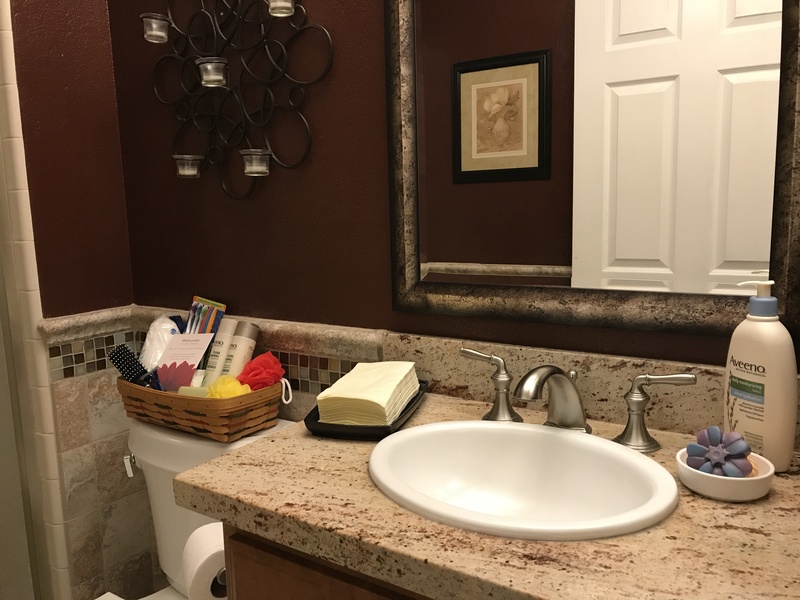 Well as I said earlier I decided to take my guest room makeover a step further and reorganize my guest bathroom and ready it for guests. The first thing I did was clean out the under sink cabinet. 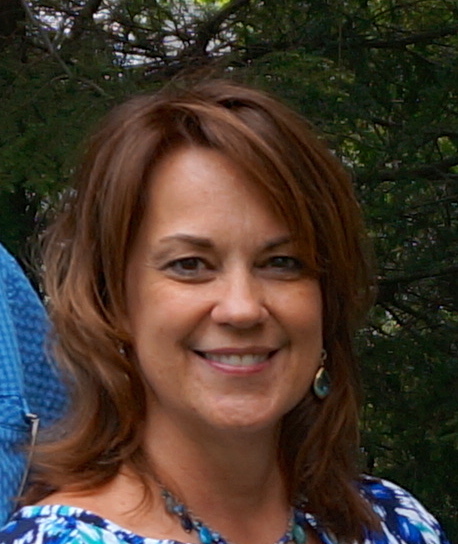 Before you look at the before photos – please remember that I have six kids! While this is the guest bathroom, it is most definitely used on a daily basis by one or more of the kids. 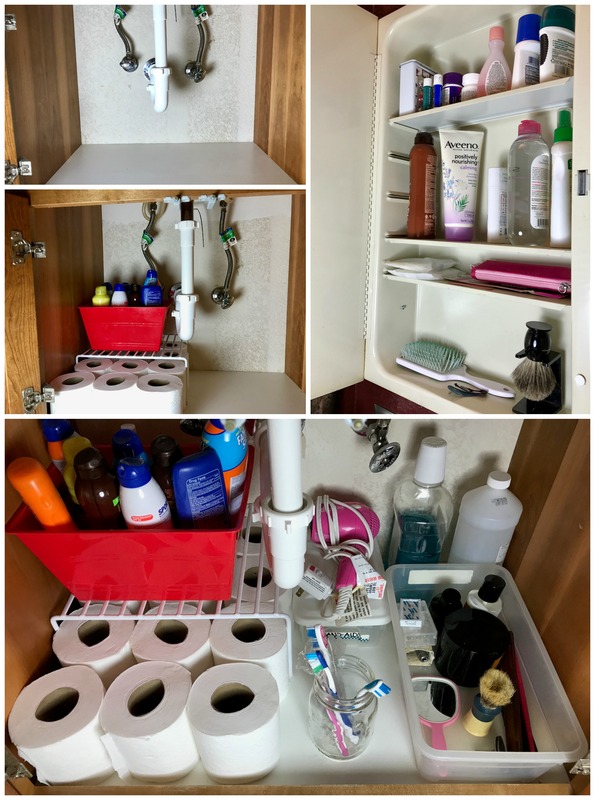 If the kids bathroom is being occupied, they shower and get ready for the day downstairs. Sigh! So much stuff crammed in there. Can you believe that I found 6 hair brushes and 5 combs? I also found a plethora of sunscreens. Since we have a pool, I keep a lot of sunscreens on hand. But buried under all of that other stuff – they were lost. First, I emptied everything out and gave the cabinet a good scrubbing. Then I sorted all of the paraphernalia, tossing a lot, returning some items to a better location, and I organized the remaining items. 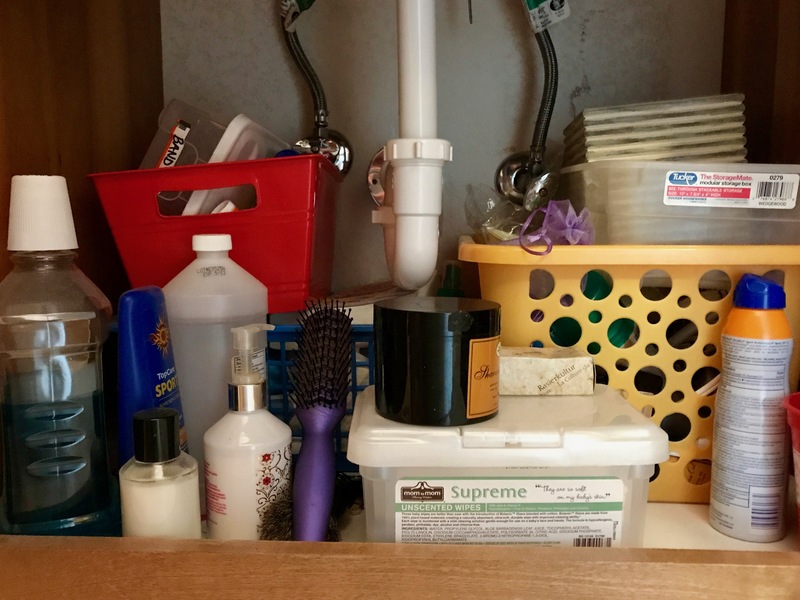 I added a riser under the sink. This made room for 12 rolls of toilet paper! Something that never fit under the sink before. Then it was time to put together my guest basket. I headed to Walmart to pick up a few things. I love the way the basket turned out! I chose this basket in particular because it fits on the top of the toilet. This is a small bathroom and there is not a lot of space. So when guest come over, the basket can sit right there for easy access. When I was shopping for my guest basket, I shopped like I would for my family. I stopped and read the labels. AVEENO PURE RENEWAL® Shampoo and Conditioner contains naturally derived cleansers and a sulfate free formula to gently cleanse your hair and scalp. As I said, it’s important to me to understand what I’m putting in and on my body. That’s why I choose sulfate-free hair care products like AVEENO PURE RENEWAL® Shampoo and Conditioner. It’s also why I choose it for my friends and family. In choosing AVEENO PURE RENEWAL® Shampoo Conditioner, I know that I’m doing my best to achieve my goals of living a healthy lifestyle. I also picked up some new guest bathroom towels. Now, we have a linen closet full of mismatched and bright colored towels, but I wanted a new set for my guests. I quick wash with all® fresh clean ESSENTIALS® and they are ready for use. 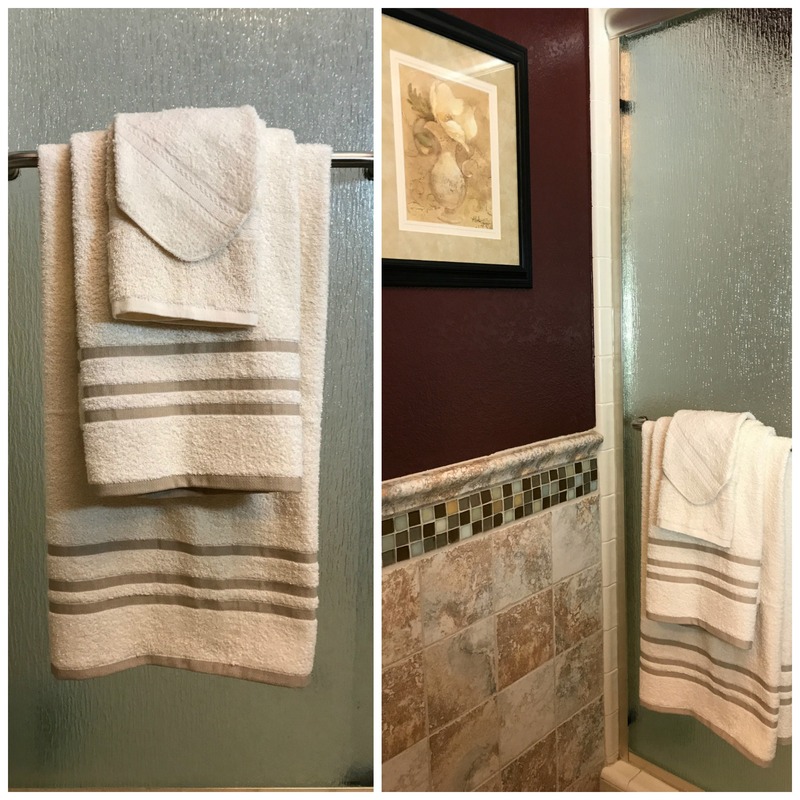 While my towels were new and not dirty I know that the sulfate-free formula infuses fabrics with essential and effective ingredients for deep cleaning. It lifts out even some of the toughest stains. Looking good! But to be clear – remember I have a house full of kids and nothing stays clean and shiny for long. 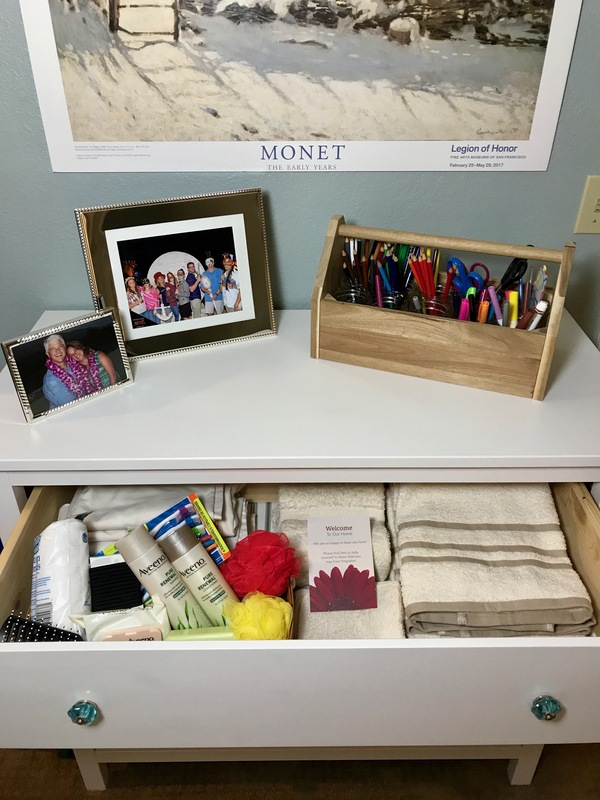 To make sure that everything is ready for guest – I store my guest items in the top dresser drawer in the guest room. When guest come over, I have clean sheets, towels, and my Welcome Guest Bathroom Basket ready to take out and use. Then the guest have an empty drawer ready for them to use. A perfect plan! 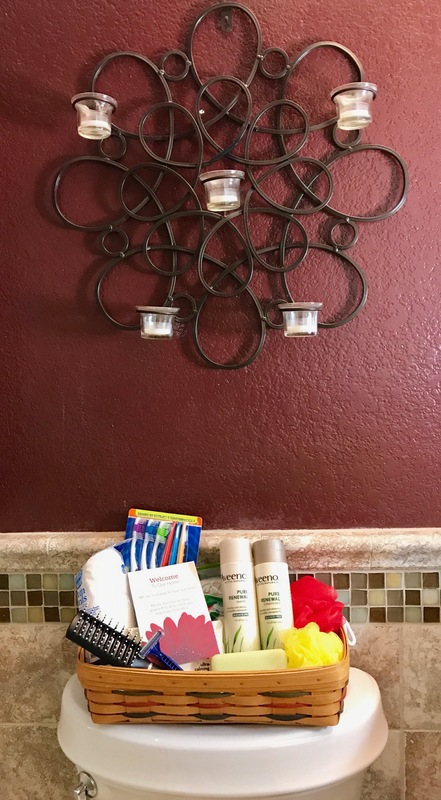 I bought everything that I needed for this bathroom clean up and Welcome Guest Bathroom Basket at my neighborhood Walmart. 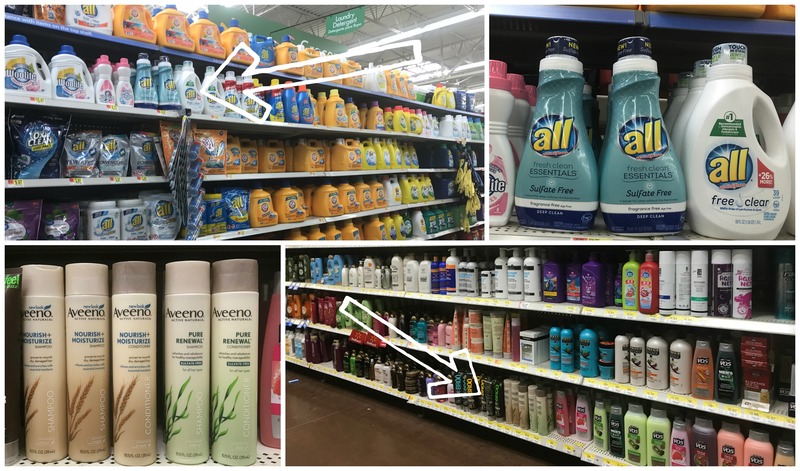 You can find the all® fresh clean ESSENTIALS® near the top shelf in the laundry aisle at your local Walmart. I found my AVEENO PURE RENEWAL® Shampoo and Conditioner on the very bottom shelf in the Hair Care aisle. And I have a deal to share with you! If you like saving money than you will want to get these coupons! Simply click HERE for a coupon that is good for $.50 off one (1) all® product –while supplies last. Then click HERE to save $1.00 off one (1) AVEENO® product (excludes trial and travel sizes). And just for you! Here is the Welcome to our Home Card. 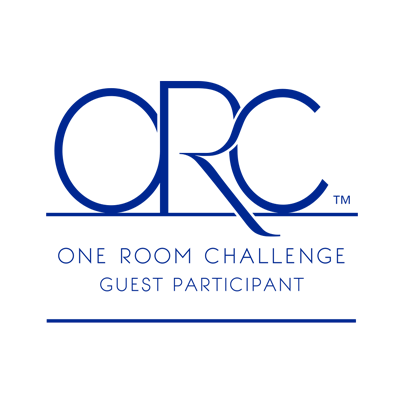 Simply click Be-our-guest-welcome-bathroom-basket to open a full size and it is ready for you to print. Be sure to check out the FreeOfSulfates.com to see how others are living a healthy life and using these Sulfate Free products. 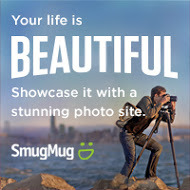 I promise you, you will be inspired!